Wonder Forge has once again hit a home run with the new holiday line-up! We where sent 4 games to review Sofia the First Magical Tea Party Game , Princess Sofia Surprise Slides Board Game , Jake & The Neverland Pirates Treasure Hunt Game & Doc McStuffins All Better Game ! They where al a hit! We always love every game Wonder Forge sends to us! They always are well made, well thought out and engaging! And because Wonder Forge is truly amazing they are allowing us to give 5 readers each a set of the 4 games mentioned! Yep, FIVE people will win Sofia the First Magical Tea Party Game , Princess Sofia Surprise Slides Board Game , Jake & The Neverland Pirates Treasure Hunt Game & Doc McStuffins All Better Game ! This prize will definitely make someones holidays brighter!! That is over $100 in Board games! Looking to ensure your lil one gets these amazing games? They can be found on Amazon, at Walmart, Barnes and Noble, Target stores and other retailers nationwide! came together to develop extraordinarily fun, original, quality play experiences. Wonder Forge preschool titles celebrate the “can do” in all kids, engaging them physically, socially, and creatively. Our family games bridge generation gaps and build lasting family bonds. Today Wonder Forge offers more than 80 games, puzzles, and apps created in partnership with some of the industry’s top licenses, and honored with more than 130 prestigious awards for product excellence. Yo ho, let’s go! Captain Hook has buried pirate booty all over Shipwreck Beach. 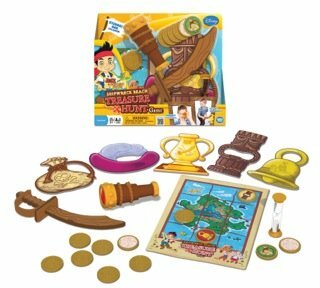 Flip over the gold doubloons and use Jake’s spyglass to decode the secret clues. When you get a match, get up and go! Snag the correct treasure with the foam sword and hurry back to score! It’s time for tea with Princess Sofia! As the magical teapot blows on your tea, the color in your teacup changes! There are so many pretty treats for tea time. When the color in your teacup changes, you earn the treats on the plate of the matching color! Along the way, Sofia and the Good Fairies reward you for your proper tea time manners! Make the boo boos go away like Doc McStuffins! Each slap bracelet bandage is a different mystery ouchie. Take turns trying to figure out which doctor tool will make things all better! It’s a fun game of pretending and playful problem-solving! Join Sofia and her friends on a magical race where new slides can appear at any time. Turn over the big slide tiles and reveal new slides—sometimes they move you forward, sometimes back—it’s always a fun surprise. A different game every time you play!